In September, wooden decking and metal fasteners will be repaired on the tiny Millers Neck Road bridge. 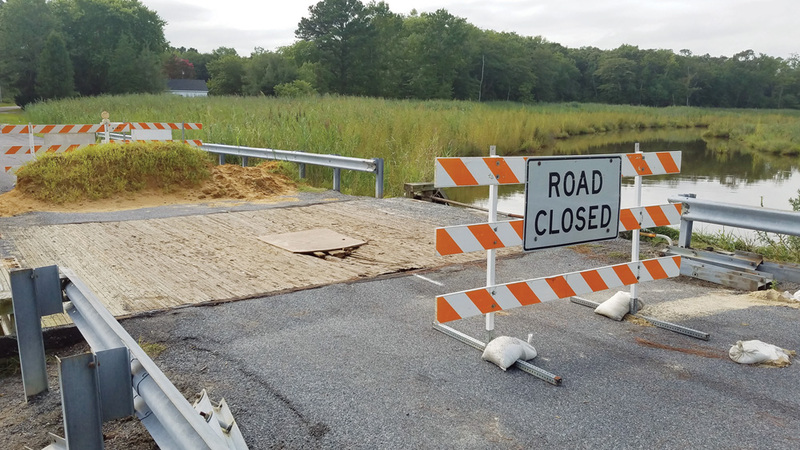 For the past month, the Millers Neck Road bridge — as it is known — has been blocked by orange gates pointing drivers toward a 4-mile detour. The wooden slats have been damaged in a small section near the center of the bridge. State Rep. Ron Gray (R-38th) and state Sen. Gerald Hocker Sr. (R-21st) are inviting nearby residents to a public meeting about the repairs of the structure, on Friday, Aug. 24, at the Roxana Volunteer Fire Company fire hall. Delaware Department of Transportation (DelDOT) officials will answer questions about the timeframe for construction and any other details related to the repairs being made to the bridge. “The bridge structure under it is fine, but they think heavier vehicles got on it and cracked the wood. … They can tell us more, but they think most of that deck has to be redone,” Gray said. DelDOT has also dumped a dirt pile in the road to prevent vehicles from bypassing the “Road Closed” signs. “Once they discovered there was a problem with the decking, they thought it was unsafe and they closed it,” Gray said. The original detour was announced in a July 24 traffic advisory. Gray said he has received several calls about it, so the legislators asked DelDOT to meet with the public directly. “I think that’s my role here, and also put a little extra pressure. … It doesn’t hurt for them to know the community is anxious for them to get down there,” Gray said. “This really affects those that live down there in that area,” even if it’s not a main throughway. “Hopefully, the residents will understand what’s going on, and at the same time,” he said, DelDOT will feel some pressure to begin construction. The project is slated to begin on Sept. 17 and take three to four weeks, said Jason McCluskey, maintenance engineer for DelDOT’s South District. “Any questions they have, bring to the meeting,” McCluskey said. While its official address is in Frankford, the bridge is actually located in the unincorporated Bayard area near the Assawoman Wildlife Area. When repaired, the bridge will return to its original wood-topped design. Although salt-treated structural-grade wood might seem like a retro building material, DelDOT officials decided there were no design flaws and noted that the bridge had held up well since the 1980s. “[It] looked like the fasteners had failed, so that would be your nails from deckboard to deckboard had rusted out and the tie-rods had also failed,” but heavy vehicles certainly contributed to the deterioration, McCluskey said. That initial investigation took several weeks, plus several more to order the specially-manufactured replacement materials. Utilities were temporarily moved out of the way, but service should not be impacted.